A 73 year-old female presented to the emergency room with a 5-day history of left lower quadrant pain, fever and leukocytosis. 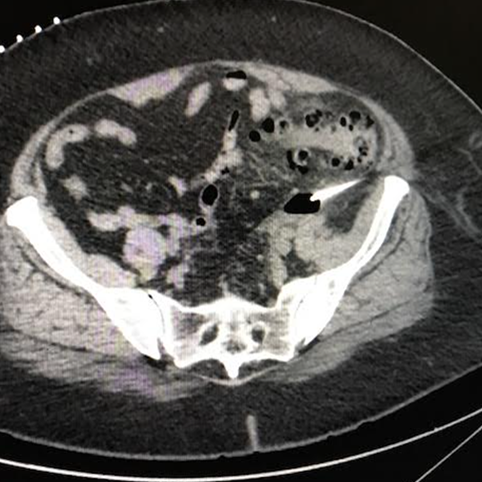 A contrast enhanced CT scan revealed sigmoid inflammation and thickening compatible with diverticulitis and 3.5 x 1.4 x 2.1cm perisigmoid fluid collection compatible with abscess. Percutaneous drainage of fluid collection by interventional radiology was requested by the ordering surgeon. 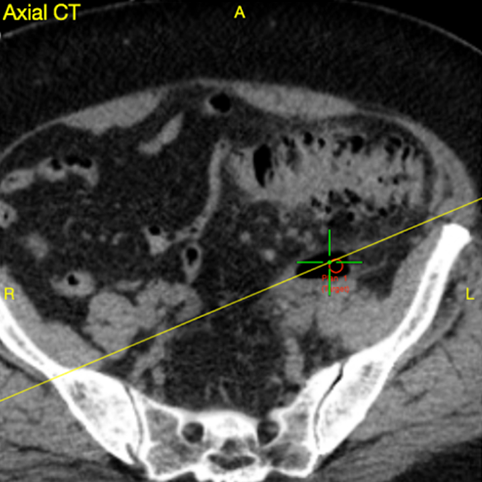 Review of CT scan revealed a narrow window between the anterior iliac bone and adjacent bowel and iliac vessels for which the drain could be placed. Veran’s SPiN IR™ Navigation application was used to safely and accurately access the abscess percutaneously without traversing these adjacent vital structures. SPiN IR™ Navigation also obviates the need for CT fluoroscopy thereby reducing radiation dose to the patient and eliminating radiation exposure to the interventional radiology team. The center of the abscess was targeted and was identified for safe percutaneous abscess drain placement. 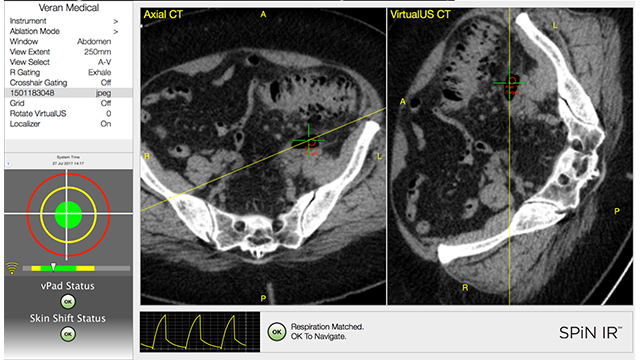 Using the Veran software, needle trajectory was carefully reviewed and confirmed circumvention of normal bowel and iliac vasculature. After informed and written consent was obtained, the patient was placed supine on the CT table. A vPad™ was then placed on the anterior abdomen/pelvis. A pre-procedure CT scan was then obtained. The patient received IV sedation and the anterior left pelvis was sterilely prepped and draped. The entry point was identified and 1% lidocaine was administered subcutaneously. A small skin nick was made at the entry site. Using Veran’s SPiN IR™ Navigation, a 19ga Always-On Tip Tracked® needle was advanced between the left anterior superior iliac spine and bowel into the perisigmoid abscess, avoiding the left-sided iliac vasculature. Limited follow up CT scan of the area of interest confirmed accurate positioning of the needle tip within the center of the targeted abscess. A .035 Bentson wire was then advanced through the needle and into collection and the needle was removed. An 8 French all-purpose pigtail drainage catheter was then advanced over the wire and wire was removed. Purulent fluid was aspirated from the catheter and sent for appropriate laboratory evaluation. Pigtail was formed and catheter sutured into place. 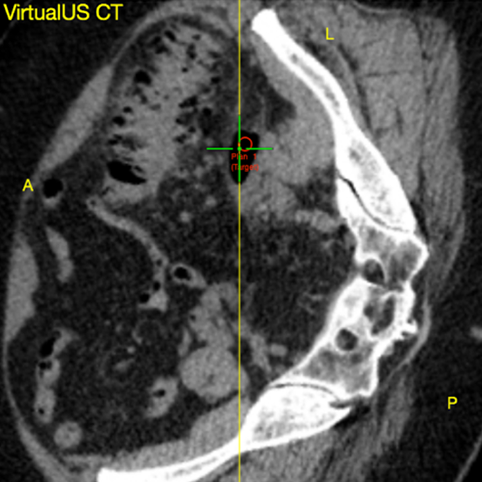 A post-procedure CT scan was then performed, confirming accurate placement of the pigtail within the center of the abscess. The patient tolerated the procedure well with no evidence of post-procedure complication. The drainage catheter was removed after resolution of abscess.